The moment they stepped into the photo shoot studio, a sea of chatter erupted amongst the staff ! It started with the the photo shoot staff, of course, and got relayed from person to person to person!! In the midst of what would normally be a tense atmosphere, these 2 were in a relaxed mood and brimming with smiles. Taking the lead as the photo shoot advanced, they were already holding hands ☆ Giving the impression that they had completely become good friends, the conversation between Airi and Mayu begins!! What did you think when you heard about the decision to have this photo shoot? Airi: About Mayu-chan, I knew well of her since she's a member of AKB, so I was wondering, 'would be all right for her to have a photo shoot with me?' and I was really nervous. However, I was also looking forward to the day of the photo shoot. Mayu: When we started the photo shoot, my heart was pounding (laughs). Airi: I was just as nervous. Moreover, since we started with shooting for the front cover, the cameraman was instructing us to 'go a bit closer', I was a bit self conscious. Mayu: But, when we talked about the foods that we like, the bugs that we hate, we got excited! Airi: That's right. Now how did we end up talking about those......When we saw a huge butterfly fluttering around, we ended up talking about bugs, right? Mayu: And then, we talked about liking fresh cream. What do you feel, what are your impressions when seeing one another in television or on magazines? Airi: What I always think about...... Her skin is so slippery smooth (laughs). For me, no matter how I say it, I have this dry sensation, so from when this photo shoot was decided, I bought face lotion with hyaluronic acid in it from the convenience store, to prepare myself for this day. Also, there's an impression that she's level-headed. That's what I think after watching things like '24 Jikan Terebi' (24-hour Television). Mayu: Airi-chan, she's cute, and good at singing, I think she really is amazing. Inside, I have this impression that she's an honours student and reliable. However, having met her today, I think that she's a playful girl. Airi: Ah~. Since I immediately did nothing but weird movements, I guess. Acting like a kappa, or walking all bow-legged (laughs). Mayu: Immediately coming out with puns (laughs). When I tried looking you up on Wikipedia, 'loves making puns' was written, and you really made one~, it moved me today (laughs). Airi: I often say things like, 'Yabuka ni Hifu wo Yabukareru' (My skin was violated by an aedes mosquito) (laughs). All of the staff-san were sniggering though! My impressions of Mayuyu, it doesn't differ from when I watch her on the television. Kinda like, it's definitely Mayuyu (laughs). Her voice when we're talking normally too, you'd say her face is just like that, and you'd say she cute just like she is. I was worried at the start, as I'm bad at speaking smoothly (laughs) Even though I don't call her 'Mayuyu', we were able to chat normally in the end. In this world, I believe that there are a lot of people who see Hello! Pro and AKB48 as rivals though...... Particularly ℃-ute and AKB48, your formation in 2005, and your indies CD debut in 2006 are similar points. As two of the persons concerned , how were you aware of one another? Airi: Indeed, we were referred to as rivals, but I thought that they were cute when I saw them on the television, and around me there were a lot of people who liked AKB as well. When I go for karaoke, a lot of times my friends would sing 'Iiwake Maybe' or 'Oogoe Diamond'...... For ℃-ute, in the beginning, Okai Chisato-chan in particular liked them, and she brought AKB's DVD to the dressing room, and everyone watched them. Watching the PVs is a given, and we properly watched up to the making-of (laughs). Mayu: Eh, is that the case? It makes me really happy ☆ I came to know of you from the time of 'Sakura Chirari'. The way the word ℃-ute was written was mysterious, I thought that it was a cute group. Harugon (Nakagawa Haruka), who was in the same team as I was during that time, and is currently together with me in Watarirouka Hashiritai, brought ℃-ute's live DVD to the dressing room, everyone was saying 'Since this is cute, let's imitate them~' while watching it. Also, 'Tokkaiko Junjou' became a craze among the members! Everyone was imitating the 'Are you ready' of the chorus. Therefore, rather than rivals, they're a presence that we love. Have you never come in contact through work before this? Mayu: Previously, there was a time when we appeared at the same event (Yamada Denki Consumer Electronics Fair in Nagoya Dome), didn't we cross each other's paths? Airi: We crossed each other's path at the dressing room. And, I got ice cream (laughs). Mayu: Ah, that's right! Since Harugon wanted to meet ℃-ute, she proposed bringing along ice cream to greet them. (laughs) And, since everyone wanted to meet them , I brought along my own ice cream. Airi: We talked about bugs, and there was a common point. When we get bitten by a mosquito, it grows big and spreads out (laughs). Mayu: She's come up with a pun~ (laughs). Well, what sort of kid were you when you were small? 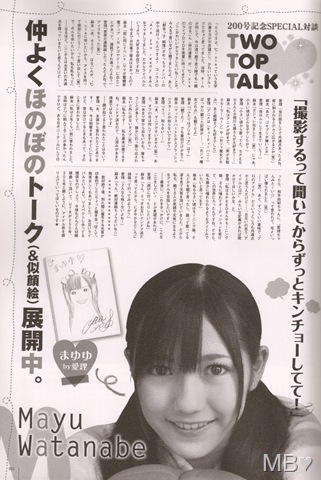 Mayu: I like anime, such as 'Bishoujo Sensehi Sailor Moon' or 'OjaMajo Doremi', and I also liked things to do with sentai. Airi: I watched that! But only the beginning, I guess? Mayu: So you don't know about Max Heart or Splash ☆ Star? Mayu: Ah, sorry for being such a fanatic (laughs). Also, what do you do on your days off? Airi: I probably wouldn't leave the house. Most of the time I end up sleeping, and I'm the type who doesn't go outside if there's no one to drag me out (laughs). Mayu: Me too! I basically end up sleeping too. As well as being the indoor type, I'm not really that good at where it's packed with people. Has no one ever mentioned that you two look similar? Airi: Ah, my friends have mentioned it! Even though nowadays my bangs are cut straight, there was a time ages ago when I parted them, and it was mentioned to me at that time. Mayu: It was mentioned of me about 2 years ago. At the time, I mostly did twin-tails, but when I put up a ponytail, Kashiwagi Yuki-chan said 'You look like Airi-chan ☆', and she took tons of photos (laughs). 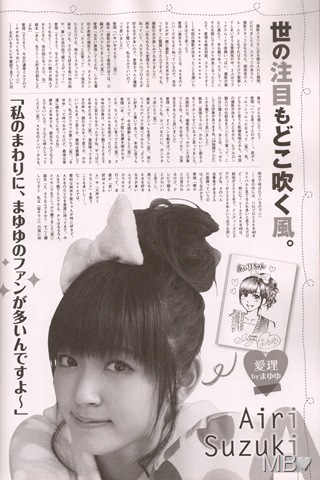 Airi: As I looked up to Speed-san and Morning Musume.-san, I tried for an audition, and thus I entered into this world. Therefore, I also think that I'd like to become an idol that anyone can aspire to be. Finally, is there anything you wish for, like 'if I had the chance, I'd like to do this!'? Airi: I'd like to go and hang out. Mayu: Yup. Since just now, both of us mentioned that we're indoor types, should we try doing our best to go to bustling places? Airi: It won't be scary since there's the 2 of us, right! they seem to get well :) that's great, they are both lovely!